This page describes dashboard user administration in Archivematica via the dashboard. For higher level, technical administrative documentation, please see Administrator manual. The Archivematica administration pages, under the Administration tab of the dashboard, allows you to configure various parts of the application and manage integrations and users. Default, which is used for any transfer started manually from the Transfer tab, automatically via the automation tools, or in any other context where no other processing configuration is specified. Automated, which is used for transfers automatically started from Jisc RDSS environments (if you are not a Jisc user, feel free to delete this configuration). To edit an existing processing configuration file, click on the Edit button to the right of the processing configuration name. Multiple processing configurations can be created using the Add button on the Processing Configuration screen. Often, users create multiple configurations for different types of content - one for audio-visual material, one for images, one for textual records, etc. You can also revert the default and automated processing configurations to their pre-sets by clicking on Reset. Please note that the pre-sets for the default processing configuration are noted in the Processing configuration fields section below. When you reingest an AIP, you are given the opportunity to select which processing configuration you’d like to use. You can download the processingMCP.xml file by clicking Download. Then, rename the file processingMCP.xml and include it at the top level of your transfer. Archivematica will then use this to automate your transfer selections, rather than the default configuration. For more information on the processingMCP.xml file, see Creating a custom config with processingMCP.xml. All other transfers will use the default processing configuration. In order to edit any of the selections, select a choice from the drop-down menu to the right of the job name. Once you’ve made all of your selections, save the processing configuration. The fields are described in the next section. Many jobs in the Archivematica transfer and ingest tabs have configurable decision points. Automating these decisions can make the transfer and ingest process substantially quicker, especially if you find yourself selecting the same decisions over and over. Below is a list of the processing configuration form fields with a short description about how they work and the drop-down options for each. The option marked by an asterisk is the pre-set value for the default processing configuration. If you change the default configuration, you can click on Reset to revert all changes back to the installation pre-sets. The name of the processingMCP.xml that you are editing. Directories are given an entry in the fileSec and assigned a unique universal identifier (UUID). Note that the digital objects in the transfer are always assigned a UUID. Yes - UUIDs are assigned. No - UUIDs are not assigned. Transfers are sequestered until virus definitions can be updated. None - the user is prompted for a decision. Yes - transfers are automatically quarantined. Transfers are automatically removed from quarantine after a defined number of days and made available for further processing. Enter the number of days that transfers should remain in quarantine (i.e. 5). The default value for this field is 28 days. A text file is generated showing a directory tree of the original transfer structure. Yes - structure report is created. Choose a tool to identify the format of the files in your transfer. Identify using Fido - use Fido to identify files by their file signature. Skip File Identification - files will not be identified. Identify using Siegfried - use Siegfried to identify files by their signature. Identify by File Extension - identify files by their extension rather than signature. Packages (such as .zip files) are unzipped and extracted into a directory. No - package is left as-is. Packages that have been extracted in the previous step can be deleted after extraction. No - the package is preserved along with the extracted content. If you are processing a Dataverse transfer, you must select “No”. The Dataverse transfer will fail if packages are deleted. If you create policies using MediaConch, run the policies against the transfer to assess conformation. Yes - the transfer is checked against any policies. No - policies are ignored. Run Bulk Extractor, a forensics tool that can recognize credit card numbers, social security numbers, and other patterns in data. For more information on reviewing Bulk Extractor logs, see the Analysis pane on the Appraisal tab. Yes - Bulk Extractor scans content and creates log outputs of recognized patterns for review. Create a formal SIP out of the transfer or send it to the backlog. Send to backlog - transfer is sent to a backlog storage space for temporary storage or appraisal. Create single SIP and continue processing - transfer becomes a SIP and is made available for further processing on the ingest tab. If you are running Archivematica in indexless mode (without Elasticsearch), the backlog will be unavailable and the Send to backlog option will not be present in this dropdown. Choose a tool to identify the format of files in your SIP. Identify by File Extension - identify files by their extension rather than their signature. Convert ingested digital objects to preservation and/or access formats. See Normalize for more information. Normalize for preservation and access - creates preservation copies of the objects plus access copies which will be used to generate the DIP. Normalize for preservation - creates preservation copies only. No access copies are created and no DIP will be generated. Normalize manually - see Manual Normalization for more information. Do not normalize - the AIP will contain originals only. No preservation or access copies are generated and no DIP will be generated. Normalize service files preservation - see Transferring material with service (mezzanine) files for more information. Normalize for access - the AIP will contain originals only. No preservation copies will be generated. Access copies will be created which will be used to generate the DIP. The dashboard allows users to review the normalization output and the normalization report. Yes - skip the review step and automatically continue processing. This gives the option of generating thumbnails for use in the AIP and DIP. Yes, without default - thumbnails will be produced for any format which has a normalize for thumbnails rule in the FPR. Formats which do not have a rule will not have a thumbnail generated. No - thumbnails will not be generated. Yes - thumbnails will be generated according to the format rules in the FPR. Formats which do not have a rule will have a default thumbnail generated (grey document icon). If you create policies using MediaConch, run the policies against the newly-created preservation derivatives to ensure conformation. Yes - the normalized files are checked against any policies. Assign persistent identifiers and send the information to a Handle Server (must be configured). Yes - PIDs are created and a API call posts the PIDs to the Handle Server. No - PIDs are not created. By default, Archivematica removes empty directories and does not document that they existed. Yes - an entry for the directory is created in the structmap. No - the directory is not documented. Archivematica allows users to see add metadata to a SIP through the user interface. This reminder occurs at the last moment that it is possible to add metadata; once the ingest proceeds past this point, it is no longer possible to add metadata to the SIP. None - the user has a chance to add metadata. Users can elect to run Tesseract, an OCR tool that is included in Archivematica, to produce text files containing file transcripts. For more information, see (see Transcribe SIP contents). Yes - Tesseract runs on all OCR-able files. Choose a tool to identify the format of any submission documentation and/or metadata files that were included in your transfer. Skip File Identification - file identification is not run on submission documentation or metadata files. AIPs created by Archivematica can be stored as compressed packages or uncompressed, depending on your storage requirements. 7z using LZMA - a 7Zip file is created using the tool LZMA. Uncompressed - the AIP is not compressed. Parallel bzip2 - a 7Zip file is created using the tool Parallel bzip2 (pbzip2). If you selected a compression choice in the step above, you can determine how compressed you would like your AIP to be. Selecting a higher compression level means that the resulting AIP is smaller, but compression also takes longer. Lower compression levels mean quicker compression, but a larger AIP. 7 - maximum compression - a smaller AIP that takes longer to compress. 9 - ultra compression - the smallest possible AIP. 3 - fast compression mode - a larger AIP that will be compressed quickly. 1 - fastest mode - the AIP will be compressed as quickly as possible. Once processing is complete, AIPs can be stored without interrupting the workflow in the dashboard. Yes - the AIP is marked for storage automatically. If the previous step and this step are configured, all AIPs will be sent to the selected storage location (unless you have included a custom processing configuration with the transfer that defines another location). Default location - the AIP is stored in the AIP storage location that has been defined as the default in the Storage Service. [Other storage locations] - any other AIP storage locations that are available will also appear on this list. 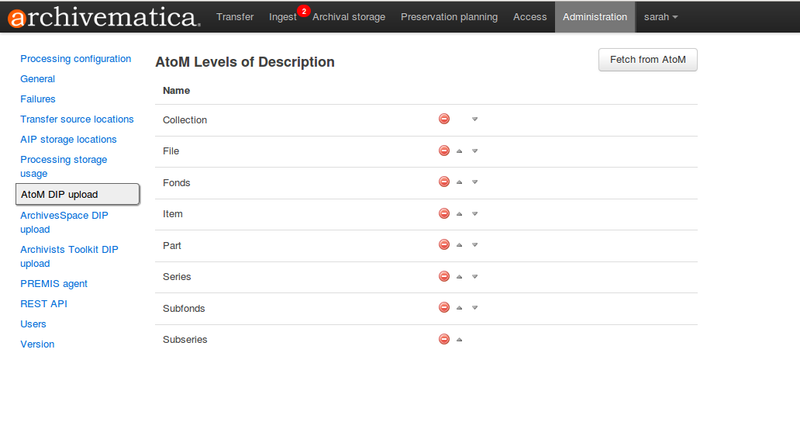 If a DIP was created, it can be automatically sent to an access system for which there is an Archivematica integration. Upload DIP to CONTENTdm - see CONTENTdm DIP upload documentation. Upload DIP to Archivists Toolkit - see Archivists Toolkit DIP upload documentation. Upload DIP to AtoM - see AtoM DIP upload documentation. Do not upload - the DIP will not be uploaded to an access system. Upload DIP to ArchivesSpace - see ArchivesSpace DIP upload documentation. If a DIP was created, it can be stored without interrupting the workflow in the dashboard. Note that DIP storage is not required, and that DIPs can be created on demand by reingesting the AIP. Yes - the DIP is marked for storage automatically. If the previous step and this step are configured, all DIPs will be sent to the selected storage location (unless you have included a custom processing configuration with the transfer that defines another location). Default location - the DIP is stored in the DIP storage location that has been defined as the default in the Storage Service. [Other storage locations] - any other DIP storage locations that are available will also appear on this list. This is where you’ll find the complete URL for the Storage Service, along with a username and API key. See the Storage Service documentation for more information about this feature. You can select which checksum algorithm Archivematica will use during the Assign UUIDs and checksums microservice in Transfer. Choose between MD5, SHA-1, SHA-256 and SHA-512. As of Archivematica 1.7, Elasticsearch is optional. 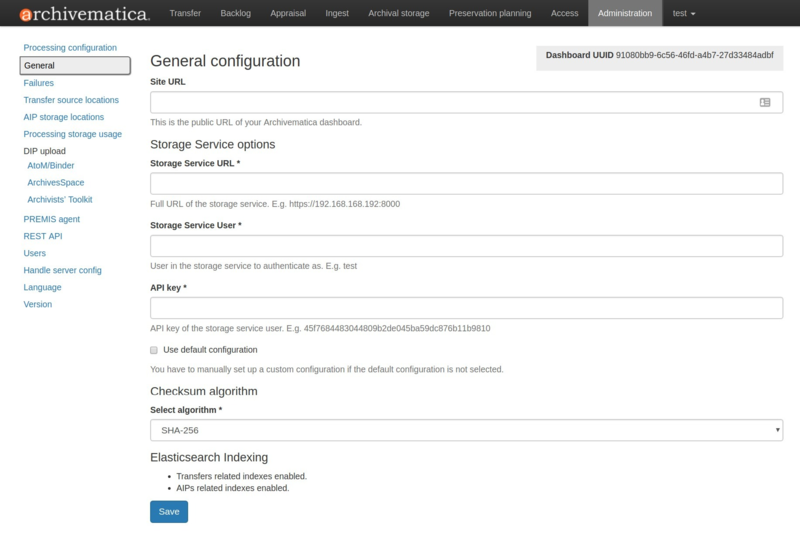 Installing Archivematica without Elasticsearch means reduced consumption of compute resources and lower operational complexity. Disabling Elasticsearch means that the Backlog, Appraisal, and Archival Storage tabs do not appear and their functionality is not available. 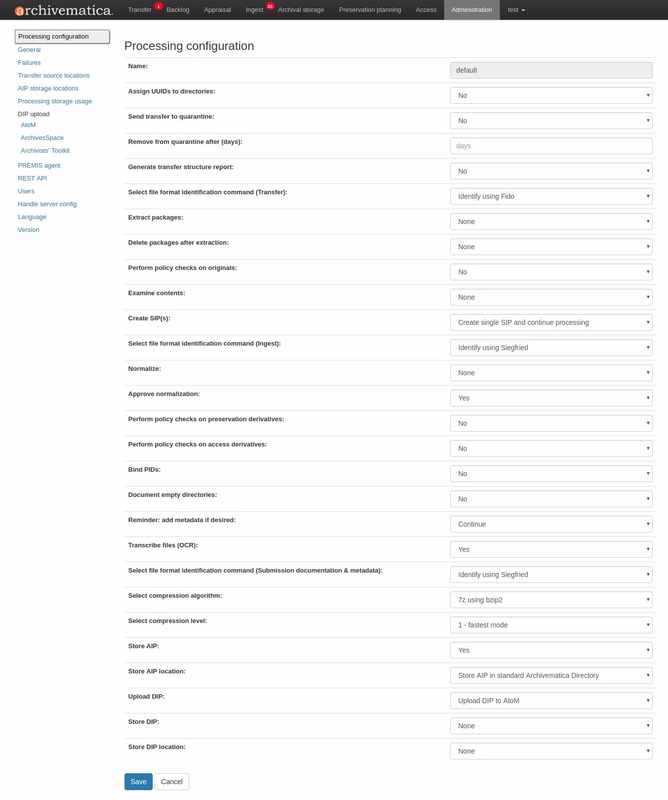 This section in the General configuration shows if Elasticsearch is enabled or disabled. This page displays packages that failed during processing. The failure report can be removed from the Dashboard by clicking Delete. Archivematica allows you to start transfers using the operating system’s file browser or via a web interface. Source files for transfers, however, cannot be uploaded using the web interface; they must exist on volumes accessible to the Archivematica MCP server and configured via the Storage Service. When starting a transfer you are required to select one or more directories of files to add to the transfer. AIP storage directories are directories in which completed AIPs are stored. Storage directories can be specified in a manner similar to transfer source directories using the Storage Service. You can view your transfer source directories in the Administrative tab of the dashboard under “AIP storage locations”. This section of the Administration page displays various processing locations with their current usage of available space. Administrators can use the “clear” buttons to delete the contents of these processing locations to make more room on their server. Archivematica has access integrations with three access platforms: AtoM, ArchivesSpace, and Archivists’ Toolkit. For more information on Archivematica integrations, please see the Integrations page. Archivematica can upload DIPs directly to an AtoM website so that the contents can be accessed online. Using the same configuration screen, you can also configure Archivematica to upload DIPs to Binder, which is built off the AtoM framework. For more information on configuring the AtoM/Binder DIP upload parameters and the servers, please see the AtoM/Binder DIP upload configuration instructions. You can fetch levels of description from AtoM so that they can be used in SIP arrange. Click on Levels of Description, then Fetch from AtoM to get an updated list from the AtoM levels of description taxonomy. If there are levels of description in the AtoM taxonomy that you prefer not to use in Archivematica SIP arrange, you can remove them using the red delete button. You can change the order that they appear in SIP arrange by using the up/down arrows in this screen. Before ingesting digital objects destined for ArchivesSpace, ensure that the ArchivesSpace DIP upload settings in the administration tab of the dashboard have been set. For more information on configuring the ArchivesSpace DIP upload parameters, please see the Admin Manual ArchivesSpace DIP upload configuration instructions. Should you wish to enable the PREMIS-based restrictions functionality, choose base on PREMIS under Restrictions Apply. To add PREMIS rights, please see Add PREMIS rights and restrictions. For more information on configuring the Archivists’ Toolkit DIP upload parameters, please see the Admin Manual Archivists’ Toolkit DIP upload configuration instructions. We no longer actively test DIP uploads to Archivists’ Toolkit. The PREMIS agent name and code can be set via the administration interface. The PREMIS agent information is used in the METS files created by Archivematica to identify the agency performing the digital preservation events. Archivematica includes a REST API for automating transfer approval. Artefactual recommends that a technical administrator configure the options for this feature. To configure Archivematica to use the REST API for automation, see Administrator manual - REST API. The dashboard provides a simple cookie-based user authentication system using the Django authentication framework. Access to the dashboard is limited only to logged-in users and a login page will be shown when the user is not recognized. If the application can’t find any user in the database, the user creation page will be shown instead, allowing the creation of an administrator account. Users can be also created, modified and deleted from the Administration tab. Only users who are administrators can create and edit user accounts. You can add a new user to the system by clicking the “Add new” button on the user administration page. By adding a user you provide a way to access Archivematica using a username/password combination. Should you need to change a user’s username or password, you can do so by clicking the “Edit” button, corresponding to the user, on the administration page. Should you need to revoke a user’s access, you can click the corresponding “Delete” button. For more information about user creation, deletion, and security, please see the Users section in the Admin Manual. Archivematica can to be configured to make requests to a Handle System HTTP API so that files, directories and entire AIPs can be assigned persistent identifiers (PIDS) and derived persistent URLs (PURLs). The language menu allows you to choose from select languages. Archivematica is translated by volunteers through Transifex. The completeness of a language is dependent on how many strings have been translated in Transifex. For information about contributing translations to the Archivematica project, see Translations. This tab displays the version of Archivematica you’re using.